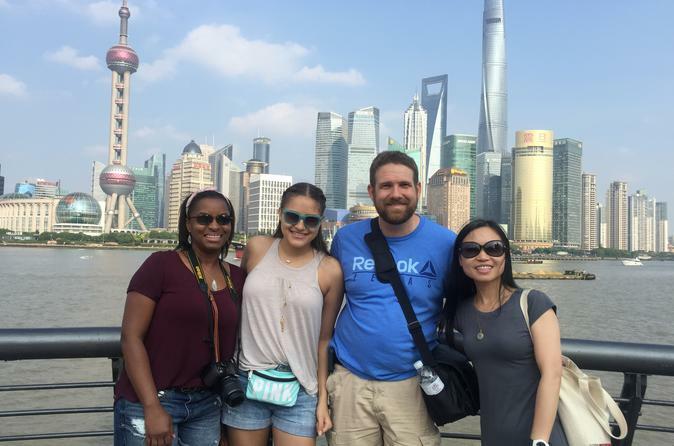 Take a private full-day tour of Shanghai that provides insight into the city's history and culture, perfect for visitors with limited time. Tour both the east and west sides of Shanghai to discover the fascinating mix of modern and classical features of this dynamic city. Includes lunch, all transportation, entrance fees, and a cruise on the Huangpu River. Start with morning pickup at 9:30am and travel with your private guide and driver to your first destination, an iconic building in the financial center. Choose from the landmark Oriental Pearl TV Tower, the Shanghai World Financial Center, the JinMao Tower, or the Shanghai Tower (the newest and highest building in China). Your guide takes you up to the observation deck for panoramic views. Next, go to the Bund, a district that was controlled by the British during the concessions period. Hear about the history as you see 100-year old architecture, views over the Huangpu River, and riverside parks. Continue to Confucius Temple, built in 1291, and enjoy the Confucius Tea Ceremony. Then browse fixed-price souvenirs in a government store before stopping for a lunch of traditional steamed buns and local dishes at a century-old restaurant. In the afternoon, visit Yuyuan Garden, a famous classical garden that was founded more than 400 years ago during the Ming Dynasty. Next up, take a stroll along East Nanjing Road, considered the best pedestrian shopping street in Shanghai, like the Champs-Elysee of China. Then take in the atmosphere of east-meets-west in the former French Concession area, where Xintiandi and Tian Zi Fang are popular for dining and shopping. Wind down your day with a relaxing 1-hour cruise along the Huangpu River. At the end of your tour, your guide returns you to your hotel.